Nexus Arts Venue located in the Lion Arts Centre*, will set the scene for the launch of my next EP Truth & Trickery. *Tram stops right in front! Car park in Hindley St. The delightful Fiddle Chicks will kick the afternoon off with their entrancing performance. Included in my band, I have, once again lured in, Emily A Smith, Emma Luker, Shireen Khemlani and Gerard Spalding. Barely home from his honeymoon, Richard Coates has agreed to come tickle the ivories with us as well! Tickets are on sale via TryBooking and include a copy of the EP! Saturday, April 27 at the very civilised time of 1:30pm, I hope to see you there. Follow up dates in Melbourne (Lomond Acoustica) May 1, Queensland (The Junk Bar with Chloe Styler) June 16 and back to Adelaide (The Wheaty with Cathy Dobson) June 23 now in the gig guide. 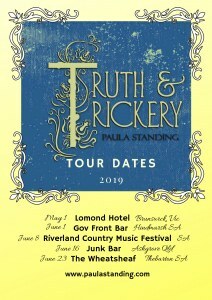 Details regarding the Riverland Country Music Festival June 8 tba. I also get to grace the Gove Front Bar stage with the esteemed Crooked Road June 1.
am a user of weƄ therefore from now I am using net for posts, thanks to web.